I bought this all steel Ross Eurotour 10 speed bicycle new from a bike shop in 1987. At the time, I just needed a light duty bike for occasional trips to town and I didn't have much money to spend on it. Although this bike had a one-piece crank, formed sheet steel stem and many other features that you would associate with lower quality "department store" variety bikes, it did have a socketed (lugged), brazed frame and seemed sturdy enough. If I recall correctly, it cost less than US$200 but the original receipt is long gone. It wasn't long after I purchased this bike that Ross stopped making bikes, then closed their Allentown doors and the lifetime warranty disappeared into history. I used this bike for a short time, then stored it for several years before and after a move. This Spring, I got the Ross out from behind the pile of junk in the garage. The tires and tubes were in good condition and accepted air but everything needed cleaning and lubricating. 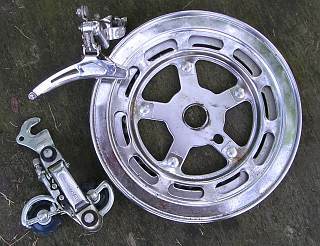 I replaced the 39-50 tooth chainwheel with a 40-52 and changed the original rubber grips which had a flange that interfered with the thumb shifters. I also replaced the marginally-working, flimsy Shimano RS derailers with an even older SunTour Honor set. The SunTour derailers from the '70s, are built solidly if not heavily and shift smoothly and reliably. These minor inexpensive improvements have not only made this bike faster but easier to operate and more reliable. The Operative Word for the Eurotour is "Heavy"
The only aluminum parts on the Eurotour are the shifters, the brake levers and the brake calipers. Everything else, except for a few plastic parts is steel. The weight before accessories is 39 lbs. If you need a bike for exercise, you can sometimes find these Ross bikes for sale cheaply. The Eurotour will give you a good workout going up the hills and reward you by going reasonably fast downhill and on level stretches. If you need a bike for commuting or long trips, and there will be hills on the way, you should look for something lighter. Otherwise, a Ross Eurotour can provide dependable transportation and no one in their right mind would consider stealing it. Note: There were several different versions of the Eurotour in any given model year. These included coaster brake, 3, 5 & 10 speed - 26" wheel versions and 5 & 10 speed - 27" wheel versions, all available in ladies & mens frame styles. This model year features some cheaper parts on the Eurotour. This is revealing when you read the history at the bottom of this page. 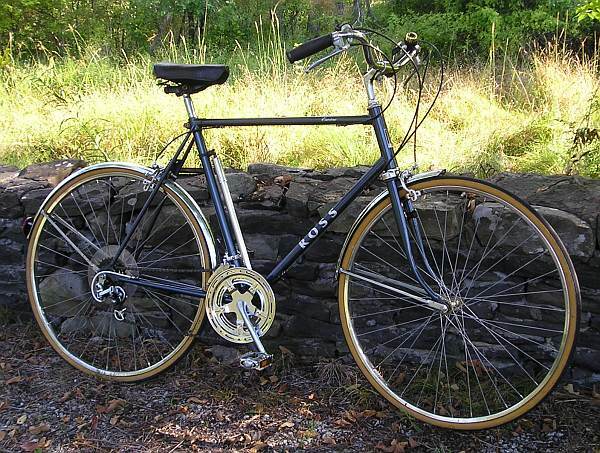 Hubs & Wheels: Ross branded steel, 36 spoke, 27"
*The model numbers changed from year to year. This number, stamped on the dropout, may in fact, be from an earlier year. The serial number indicates this frame was made in 1984 and may have been an overrun or might have been rejected for some reason. With the wolves closing in, ROSS was undoubtedly utilizing such resources. After riding the Eurotour clear through January, here in the great Northeast, I decided some upgrades could make this bike much more serviceable. I debated these upgrades with myself (read as "rationalized") and decided that due to the inferior quality of this bike, it wouldn't be worth spending more than US$50 to $75 on it. 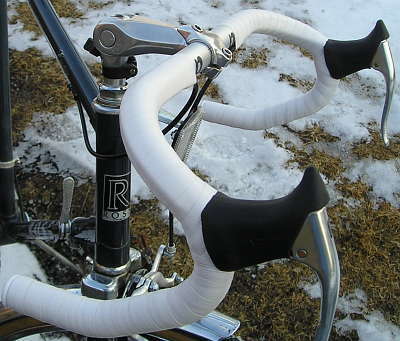 I had already changed the seat to a low-end Selle Royal model (US$18) a few months earlier and had cut down some old cheap steel drop bars and mounted them inverted. These pseudo cow horns worked better than the original bars but were too narrow for me and didn't allow for dropping down in the wind. I splurged and spent US$21 on some Dimension 25.4 - 44cm drop bars and bought some new but previously-returned Dia Compe brake levers (US$16) to go with them. 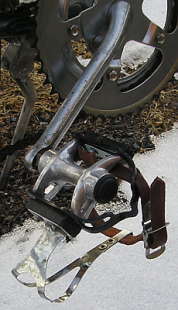 The steel pedals were iffy when new and had quickly become overly loose, wobbly and prone to binding. I replaced them with Wellgo 888 1/2" alloy quill pedals (US$16). These didn't require me to change the Ashtabula crank which is heavy but has always been trouble free. The new pedals allowed for toe clips as well and they were a very welcome addition. The tough part was finding a good 21.15 mm quill stem. I had a Kalloy (also marketed as Pyramid) 22.2 mm adjustable stem on hand, that was already slightly undersized. I did the rest of the work with a coarse file, stopping for frequent fittings in the steerer tube and filing off the high spots. A few hours, a pile of aluminum dust and a massive blister on my thumb later, I had it perfectly fitted to the 21.15 mm tube, sanded smooth and polished. I ground the steel wedge to fit, on a bench grinder. The re-sized stem works fine but I'm not sure I'd ever want to do that again. Still, with the best commercial drop-in alternative being a fixed heavy steel replacement, it was probably worthwhile. The end result of the upgrades is a very different feeling bicycle from the one it started as. It's noticeably lighter, easier to ride and it's a much better fit for the kind of riding I do. It continues to serve me very well as a Winter and general foul weather road bike. Dirty from a recent ride on the salty roads but a far better ride than it used to be. Some of these parts were on sale when I bought them and might not be now. You might want to search for better deals but this will provide you with a starting point. Most local bike shops will have to special order any parts that are specific to older American bikes, so it's just quicker and cheaper to order them on the web. Bear in mind that economy was a primary consideration in these choices but quality was also important. I don't like wasting money on ultra-cheap stuff that breaks. Saddle: Selle Royal Metro Gel Xsenium Men's $17.84 JensonUSA.com Will require a clamp designed for a single rail per side or a modern post. Handlebars: Dimension Road 25.4 mm (40, 42 or 44 cm) double groove $20.99 AEBike.com I filled the unused grooves with nylon tubing intended for model airplane control rods, tapered at the ends, but it's not necessary to do this if the flat spots don't bother you. Brake Levers: Dia-Compe Blaze Brs Aero Road Levers $15.72 JensonUSA.com These were returned merchandise and were priced accordingly. Pedals: Wellgo 888 1/2" Alloy Quill Pedal $15.99 AEBike.com The only supplier I could find that carried these in the 1/2" size. My feet are wide and I found it necessary to bend the high quill out and down a little. The frame is soft enough to do this easily with an adjustable wrench with some leather in the jaws. The bearings will need adjusting out of the box. They will be too tight. Stem: If your stem is the low-quality steel version, you'll have to do some creative scrounging. You will find some new 21.15 mm quill stems on the web but they are either all steel or half steel, half alloy. If you want to do what I did, just about any 22.2 mm alloy stem can be worked down. One source for the Kalloy adjustable stem I reworked is BikeWorldUSA.com They also carry a less expensive adjustable stem with a longer extension and can fix you up with adapters to convert your one-piece crank to a three-piece, inexpensive cables, nylon toe clips and bar tape. They are also a great source for esoteric parts for cruiser bikes and you will enjoy just perusing their inventory. Plus, they're very nice folks to deal with. Some of the other upgrades are mentioned in the original section of this article. The Toe Clips were removed from another bike due to being too small for me. I made them work on the Ross by extending them with thick plastic. I may replace them at some point but they work fine for now. The Shimano down tube Shifters were in a box with the SunTour derailers, which was in my garage when I moved here. A lucky find among tons of mostly useless junk. You may find suitable parts at flea markets and even on discarded bikes at your local dump. Keep in mind that these upgrades probably won't increase the resale value of your old American bike (and may decrease the value). If you do them, do them because it's worth it to you. See also Glenn Kamka's 1979 ROSS Eurosport single speed conversion. the Eurosport was the drop handlebar, fenderless version. Go to 1978 ROSS Compact on this site. The following draws heavily, but is edited and expanded, from a post to the bikeforums.net C&V Forum by Andrew Ross, grandson of the founder. Primary sources were used for the corrections and additions. This history will be updated as more information comes to light. 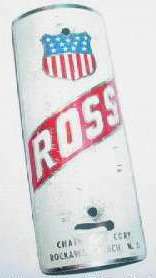 Albert Ross, founded the company in 1940 as the Ross Galvanizing Works. It was located in Brooklyn, New York near the Brooklyn Navy Yards. During WWII the company had extensive contracts with the U.S. Government to coat (galvanize) the bottoms of ships. When the war ended, at the suggestion of Albert's son, Sherwood (Jerry), and Sherwood's brother in-law Samuel Wilkens, the company switched to the manufacturing of wheeled goods including bicycles, tricycles, wheel chairs, lawn mowers and roller skates. The company was incorporated in 1946 as Chain Bike Corporation with Albert Ross as President and Sam Wilkens as VP and sales manager. The company moved its manufacturing plant to the old Arverne Hygeia Ice plant in Rockaway Beach, Queens, New York in the 1950s. By the late 1950s they were solely manufacturing bikes and trikes. At the time, Chain Bike Corp., was the 3rd largest domestic producer of bicycles after Schwinn and Huffy. Upon Albert Ross's retirement in 1969 the ownership of the company was turned over in equal shares to Sherwood B. Ross and his sister Teddy, allowing the company to be half controlled by the Wilkens family. This would create some bad blood between the two families. Sherwood was the President, engineer and driving force behind the company and deeply resented the equal control arrangement. The company moved the factory again in the early 1970s to a new facility in Allentown, PA but continued to operate the business from the Rockaway Beach office. By now, former Plant Manager, Willie Ehrlich was Vice President. During the two oil crises of the 1970s (1973 & 1979) the company worked around the clock in three shifts and turned out over 1 million bicycles in each of those years. In 1980 Sherwood bought out the Wilkens' share of the business and remained the sole owner from this point on. 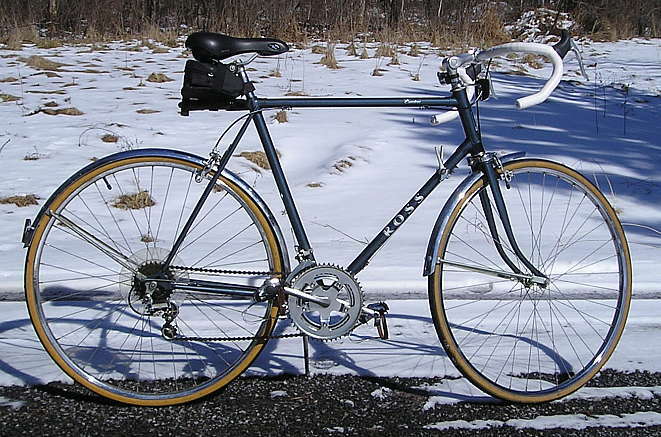 This was also the year the pricey high-end Signature series, which featured Cro-Mo tubing and Campagnolo or Shimano 600 components, was launched with Tom Kellogg in charge of the division. 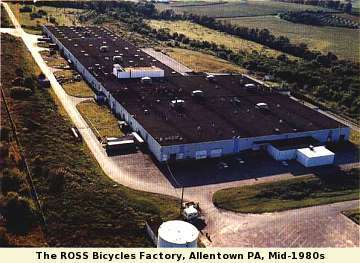 In May of 1982 the company re-incorporated as ROSS Bicycles, Incorporated. In this same year, the foreman of the rim line got caught in the machinery and suffered a collapsed lung and several other severe internal injuries. He was awarded $262.33 in weekly Workman's Comp benefits for "stomach injuries". In 1983, when it was decided that he had healed sufficiently from surgery and had refused the offer to return to his old position, the benefits were revoked and the case dragged on in the courts for more than a decade. Tom Kellogg left ROSS after two years to found Spectrum Cycles and ROSS put Jim Redcay in charge of the Signature division. Kellogg lured master builder Jeff Duser away from ROSS to Spectrum in 1985. By this time, ROSS, who had manufactured and sold over ten million bicycles, had already been feeling the squeeze from foreign imports. 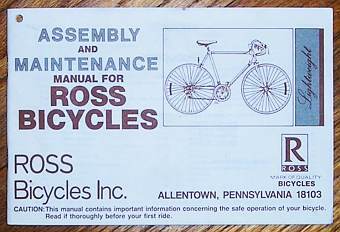 In 1984, ROSS sued East Coast Cycles and Imports, Inc. for trademark infringement. 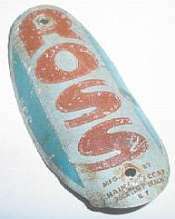 The defendant had designed and marketed a Taiwanese import bike called the "Boss Cruiser" which ROSS said was a knockoff of, not only their trademark but their Diamond Cruiser bike, as well. The court did not agree with either assertion and dismissed the case. ROSS had to pay all court costs and legal fees, including those of the defendant. In the mid-to-late 1980s, it was becoming abundantly clear that the company was in trouble. Like many American and European manufacturing companies, it found it was simply unable to compete with products imported from the Far East, made with very cheap labor. The company began to use cheaper components on its lower end products. Finally, it tried to stay solvent by shifting its bicycle manufacturing to leased factories in the Orient (Ross Import Division) and using the Allentown facility to fulfill government contracts, for ammo boxes. Sherwood Ross was reportedly accustomed to a lavish lifestyle and he decided not to make the restrictive budget management decisions that might have kept the company afloat a bit longer. All manufacturing stopped in 1987. 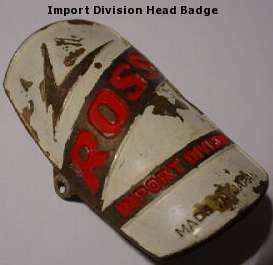 The factory was vacant for a year and in 1989 the ROSS Bicycles company went bankrupt. The ROSS name was purchased out of Bankruptcy Court by Rand Cycle (now Rand International), Farmingdale, NY. Sherwood Ross worked for Rand for 5 years as a consultant as part of the name purchase agreement. In 1998, Rand and the U.S. Consumer Product Safety Commission, announced a recall of mountain bikes they had been importing and selling for over a year. Among the various names these 11,000 bikes were marketed with, some were labeled as ROSS Mt. Washington. The defect caused the fork to part company with the frame. Several injuries, including facial fractures and lacerations, were reported. Rand International currently markets the ROSS trademark on a line of kid's bikes made in the Orient. In the early 1990s The Pennsylvania Dept. of Environmental Protection discovered toxic waste (components from plating and finishing processes) leaking from storage areas in the Allentown facility and initiated an initial cleanup to stabilize the threat. The plant was subsequently purchased in 1998 for 4.2 million dollars by Conewago Equities, LP, with the idea of leasing warehouse space. Conewago continued to coordinate the cleaning of heavy metals and chemicals from the soil and ground water around the facility with the Environmental Protection Agency. In 2007, Conewago sold the cleaned up plant with some new additions, to First Industrial Realty Trust for 25 million dollars. The old Rockaway Beach, NY facility has been occupied by a waste removal outfit, and most recently, a used auto parts business. For many years, Sherwood Ross was the President of the Bicycle Manufacturers of America (BMA). By his mid-80s, he was living in South Florida and working part-time as the pre-eminent expert witness in bicycle product liability litigation. I'm not a businessman and I don't have access to any other information about the final years of ROSS Bicycles Inc., beyond what is presented here. It's also easy to speak to what you might have done differently when viewing a situation in retrospect. However, some things seem very clear to me. In a changing marketplace, you must adapt and if one marketplace dries up you must try to appeal to another. In my opinion, it was a mistake for ROSS to continue to manufacture low-end bicycles and to attempt to cheapen the line beyond its already inferior status. They couldn't possibly compete with foreign imports which were shipping with better quality components at the same or lower cost. Becoming an importer was not the answer either. One low-quality import is much like the next. If you try to compete in this market, your product will get lost in a sea of sameness. Instead, ROSS should have expanded its production of high quality bikes like the Signature series. It may have taken some effort to change the stigma the company had, of being of a department-store-quality bike manufacturer but a campaign of brochures and posters in the better bike shops and magazine ads might have helped (Think You Know ROSS? Look Again!). Another American bicycle company, Cannondale, was just getting started as ROSS was in decline. Cannondale thrived, producing innovative bikes of a quality that you could not get (and still can't) from a Far East factory. Some consumers can only see the difference in price tags but some understand that quality goes hand in hand with safety and durability. It's the latter consumer that American manufacturing companies need to appeal to if they are to survive and prosper.